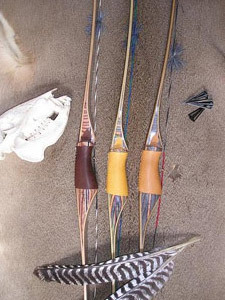 Prairie Longbows offers two bow models for sale: the Prairie Panther and the Prairie Wildcat. The Prairie Panther is a 60” reflex-deflex longbow that is very quick and extremely smooth shooting. The Panther is the flagship of the Prairie Longbows family and was its sole offering for Joe’s first three years as a bowyer. It is offered as a limited edition, autographed and numbered signature bow with each year’s production being capped at only 25 bows. A Panther can be ordered with any woods or combination of woods available and comes with a limited two year warranty as follows: 100% the first year and 50% the second year against defects in materials or workmanship. 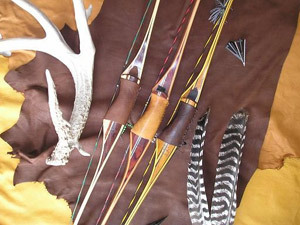 Standard equipment includes a B-50 flemish string, a fleece bow sock, and a Prairie Longbows t-shirt. The price of a Panther is $800.00 with a 50% deposit required to secure an order. The Prairie Wildcat is virtually the same bow as the Panther except it is not limited or autographed and you don’t have any wood choices with the Wildcat: this bow comes standard with a laminated Maple riser in either Desert Tan, Shadow Gray, or Woodland Green, and has Angle Cut Actionwood limbs in gray, green, or tan to match the risers. Everything else is the same as far as warranty and standard equipment, but the price on a Wildcat is $600.00. Hydro-Dipping. Hydro-Dipped bows are an option on the Prairie Wildcat, available from Sly Hydrographics of Wamego, KS for $200. Snakeskin Backing. Nothing dresses up a bow like snakeskin backing, and this option is available on your Prairie Panther for an additional $100.00. Prairie Rattler is the most commonly used skin for longbows but I will consider anything you would like to try that is available. Unless otherwise prearranged, all backings will use artificial Limbsations from Onestringer Wraps. “Mirror-Image Bows”. A very popular option that I started several years ago are my “Mirror-Image” longbows, which is basically building matching bows out of the same blocks of wood with the same limb materials. With two different woods in the riser the blocks are “flipped” on each bow so that they mirror each other…this has been extremely popular for anyone who would like a pair of matching bows, ie. hunting partners, father/son, mother/daughter, husband/wife, etc. If you order a pair of “Mirror-Image” bows the second bow is 25% off. Give me a call at (218) 338-5316 or drop me an e-mail joeblake@midwestinfo.net to discuss options, wood choices, or to answer any other questions you might have while considering your order.